Even if you're the most impulsive traveler, it's still a good idea to learn a few things about Gallargues-le-Montueux before you take off. Have a look at it on a map, record the things to do there and let the excitement begin! If you venture 6 miles (10 kilometers) west of Vauvert, or 10 miles (16 kilometers) north of Aigues-Mortes, you'll end up in Gallargues-le-Montueux. The population of this area of Gard is approximately 3,000. Get fantastic bargains on vacation packages via Travelocity. Just select from more than 400 airline partners and 665,000 places to stay, and you'll be off to Gallargues-le-Montueux in no time at all! From accommodations and flights to rental cars and activities, we can give you the peace of mind of 24/7 personal assistance with our Customer 1st Guarantee. If you chance upon an even lower price on another website, we will reimburse the difference^. All packages can be changed with no hidden fee from us. And as long as you get in fast, most accommodations don't charge extra fees either^. Be the early bird that gets the worm when it comes to organizing your accommodations in Gallargues-le-Montueux. With 6 places to stay, your choice is somewhat limited. Start browsing and reserve a cozy room today! 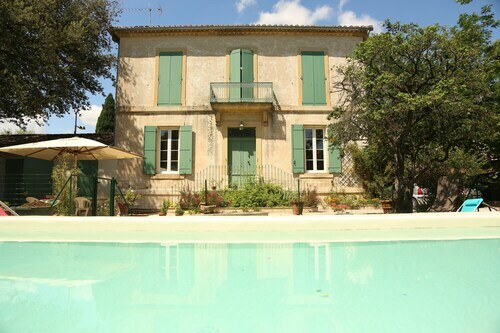 The Relais du Silence La Villa Vicha and Domaine du Grand Malherbes are some of Travelocity's top accommodation options around Gallargues-le-Montueux. Where do you fly into for Gallargues-le-Montueux? The thrill and excitement of exploring a new place will never get old. Once you've disembarked at Marseille - Provence Airport (MRS), the center of Gallargues-le-Montueux will be just 55 miles (89 kilometers) to the west from here. Can I rent a car in Gallargues-le-Montueux? Secure a rental car via Travelocity and experience Gallargues-le-Montueux at your own speed. After being stuck in a crowded cabin all day, there's nothing like hopping behind the wheel. 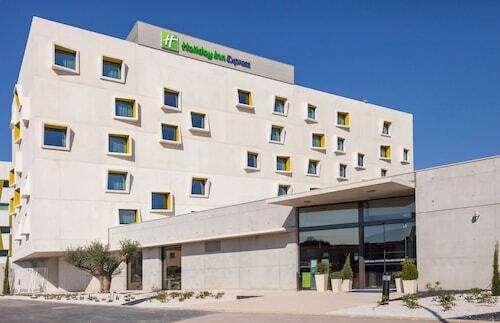 If you land at Garons Airport, pick up a rental car from Europcar, at 1 Rue Saint Felicite (Tunnel Gare), Parking gare Feucheresniveau -2, Nimes, 30000. Historic bridges are often iconic symbols of a destination. Check out Ambrussum Bridge and learn more about when and how it was constructed and the vital part its played in the city's history. Need some more options? Have you ever wondered how the masters turn the humble grape into an aromatic bottle of vino? Pay a visit to Domaine Guinand Winery to see for yourself. And that's not all. The labels on wine bottles usually only provide us with part of the story about the drop inside. Why not take a tour around Chateau des Hospitaliers Winery for a thorough history of their blends? About 16 miles (26 kilometers) from Gallargues-le-Montueux, Montpellier is much loved by travelers and locals alike. Head to this locality to access the Botanical Garden and Comedy Square, two outstanding attractions you won't quickly forget. Just 17 miles (27 kilometers) away you'll find Marguerittes, another destination that's well worth a visit. It's a handy place to access amazing attractions like the Maison Carree and the Temple of Diana. Situated in Gallargues-le-Montueux, this spa hotel is within 6 mi (10 km) of La Source Perrier, Notre-Dame du Lac Church, and Medard Museum. Office de Tourisme du Pays de Lunel and Francis San Juan Arena are also within 6 mi (10 km). Nimes Gallargues Station is 17 minutes by foot and Nimes Aigues-Vives Station is 30 minutes. 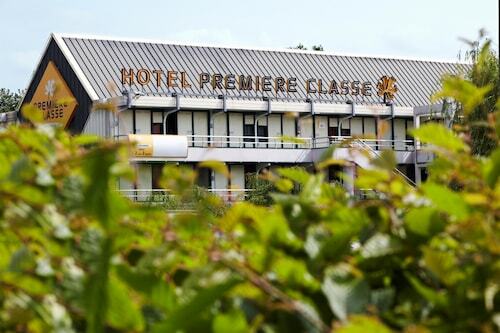 Set in Gallargues-le-Montueux, this family-friendly campground is within 6 mi (10 km) of Ambrussum Bridge, Roc de Massereau Adventure Park, and La Source Perrier. Medard Museum and Notre-Dame du Lac Church are also within 6 mi (10 km). Nimes Gallargues Station is 8 minutes by foot. Located near the beach, this family-friendly vacation home is within 6 mi (10 km) of Ambrussum Bridge, La Source Perrier, and Medard Museum. Notre-Dame du Lac Church and Office de Tourisme du Pays de Lunel are also within 6 mi (10 km). Nimes Gallargues Station is 6 minutes by foot and Nimes Aigues-Vives Station is 25 minutes. Situated in a rural location, this property is within 6 mi (10 km) of La Source Perrier, Notre-Dame du Lac Church, and Medard Museum. Office de Tourisme du Pays de Lunel and Francis San Juan Arena are also within 6 mi (10 km). Nimes Gallargues Station is 17 minutes by foot and Nimes Aigues-Vives Station is 30 minutes. 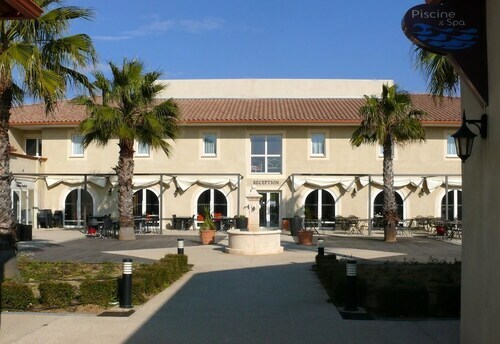 Situated in Gallargues-le-Montueux, this guesthouse is close to Ambrussum Bridge and Ambrussum Archaeological Site. Area attractions also include La Source Perrier and Medard Museum. 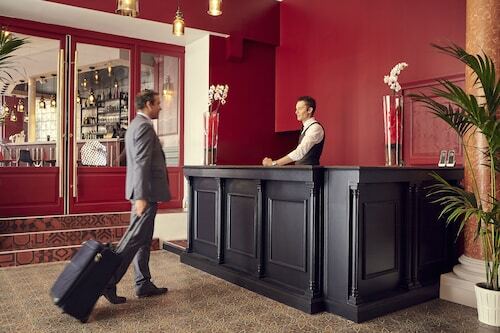 Located in Historic Centre, this hotel is steps from National Orchestra of Montpellier, Comedy Square, and Place de la Comedie. Hospital Lapeyronie is 2.3 mi (3.7 km) away. Comedie Tram Station is only a 2-minute walk and Montpellier Saint-Roch Station is 5 minutes.